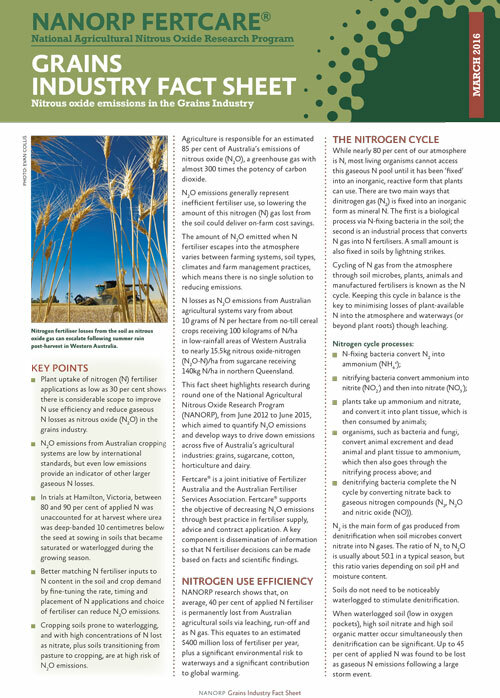 Plant uptake of nitrogen (N) fertiliser applications as low as 30 per cent shows there is considerable scope to improve N use efficiency and reduce gaseous N losses as nitrous oxide (N2O) in the grains industry. N2O emissions from Australian cropping systems are low by international standards, but even low emissions provide an indicator of other larger gaseous N losses. In trials at Hamilton, Victoria, between 80 and 90 per cent of applied N was unaccounted for at harvest where urea was deep-banded 10 centimetres below the seed at sowing in soils that became saturated or waterlogged during the growing season. Better matching N fertiliser inputs to N content in the soil and crop demand by fine-tuning the rate, timing and placement of N applications and choice of fertiliser can reduce N2O emissions. Cropping soils prone to waterlogging, and with high concentrations of N lost as nitrate, plus soils transitioning from pasture to cropping, are at high risk of N2O emissions.